Last week we took an in-depth look at the AMD’s new 2nd Generation Ryzen processor series by looking at the performance of the flagship AMD Ryzen 7 2700X 8-core, 16-thread processor that runs $329. We were impressed by how the AMD AM4 platform has matured, but we still wanted to take a look at the lower-cost models. Today, we will be taking a closer look at the AMD Ryzen 5 2600X 6-core, 12-thread processor that comes with the Wraith Spire CPU cooler for $229. This processor used the Zen+ architecture with the all the Infinity Fabric connections just like the flagship Ryzen 7 2700X model, but two of the cores in the dual-CCX configuration have been disabled at the factory. This means it is lacking 2-cores and 4-threads and has 19MB of cache instead of 20MB. That doesn’t sound bad for having $100 shaved off the price! The AMD Ryzen 5 2600X is the ‘replacement’ for the AMD Ryzen 5 1600X that can now be picked up for under under $200 now, so this years new model is selling for $30 more than last years model of the same general make. It’s closest rival from Intel would be the Intel Core i5-8600 6-core, 12-thread processor that is available for $224 shipped or the Intel Core i5-8600K unlocked 6-core, 12-thread processor for $238.99 shipped. AMD has been marketing this particular sku as having smooth gaming performance and that it is the world’s fastest 6-core, 12-thread desktop processors with machine intelligence and XFR. This year the marketing team is taunting that the Ryzen 5 2600X has the highest multiprocessor performance in its class for serious gamers and promising creators. These new processors are backwards compatible with older AMD AM4 platforms, so if you already have a Ryzen system you can drop one of these processors in after a BIOS/UEFI update and be up and running. AMD currently has two 8-core processors and two 6-core processors offered under their 2nd Gen Ryzen processor series. The AMD Ryzen 5 2600X is the flagship model with XFR (eXtended Frequency Range) that allows the clock speeds to reach 4200 MHz up from the chips base clock of 3.6GHz. AMD 2nd Gen Ryzen processors are built on the newest 12nm process technology and thanks to that AMD was able to get better frequency voltage curves that gave AMD the ability to roll out Precision Boost 2 technology to ensure you are getting optimal clock speeds at all times. The AMD Ryzen 5 2600 is still a fully unlocked part, but does not have XFR and has a base clock of just 3.4GHz and a boost clock of 3.9GHz. If you don’t want to mess with overclocking the Ryzen 5 2600X is an easy choice for $30 more, but overclockers might be interested in picking up the Ryzen 5 2600 and overclocking it up to 4GHz or higher on all cores. The Ryzen 5 2600X comes with the Wraith Spire CPU cooler and the Ryzen 5 2600 comes with the Wraith Stealth, which is the smallest of the 5 AMD Wraith coolers. The Wraith Stealth is not the ideal cooler to use for overclocking over 4GHz, so keep that in mind if you are trying to decide between the Ryzen 5 2600X and the Ryzen 5 2600. 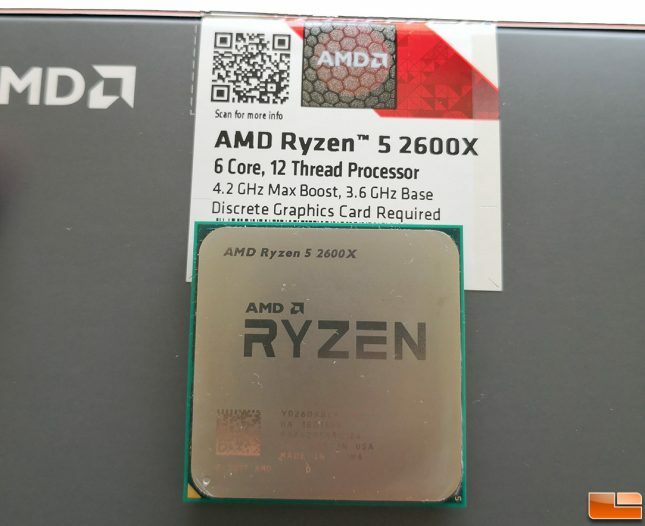 The AMD Ryzen 5 2600X processor we’ll be testing today is sold under part number YD260X and is readily available. We’ll be testing this processor on the ASUS ROG Crosshair VII Hero (Wi-Fi) (X470 chipset) motherboard ($299.99 shipped) paired with G.Skill Sniper X series 16GB (2x8GB) DDR4 3400 desktop memory kit ($229.99 shipped). 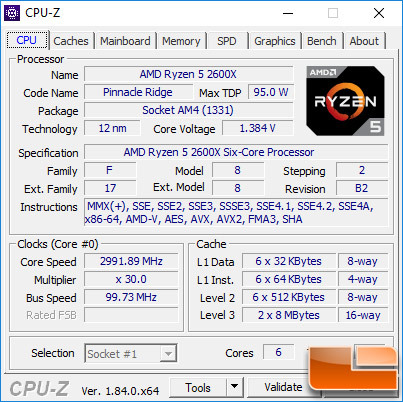 CPU-Z properly shows that the Ryzen 5 2600X is a 95W TDP 6-core, 12-thread processor with 19MB of total cache (L2+L3). Now that you know the basics and have seen the video clip from AMD highlighting some of the improvements, we can take a look at the test system and look at some numbers!